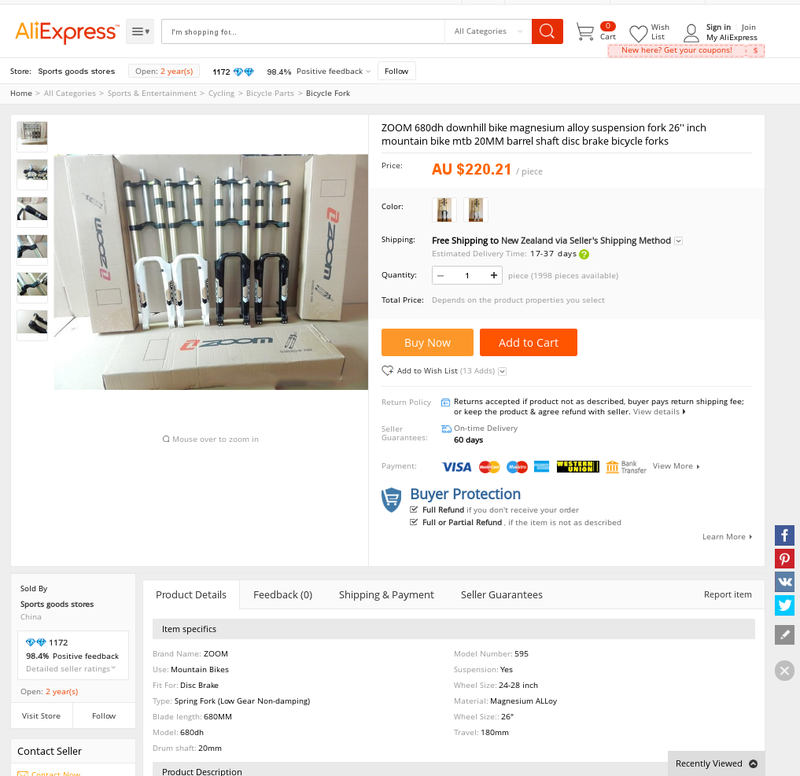 Are these forks any good considering the price? You can find them extremely cheap on aliexpress. There aren't many reviews on youtube so what would be your opinion on it? The only advantage is the cheap price. if your fork fails, there is nothing to stop you face-planting. Depending on your location, something like this fork might be better. At least if it fails you have someone more local to provide backup and support. I'm Chinese, I wouldn't buy stuff there. a lot cheaper models from named brand are made in China, with decent quality, but they will not sell on this website normally. I don't know for sure about those exact ones, but I've seen a guy in the city with Zooms, he's happy. Not sure why, since they're crap, but certainly better than low end suntours (which are the equivalent of strapping an extra 2kg to your bike and getting worse performance than rigid) note that some of the nicer suntours, when you go past the 3 letter XCR XCM etc which are all useless, are actually great value forks which I would happily ride. Also: you want 180mm double crown forks? Is your frame even compatible? Do you understand how it's going to change the geometry of your bike? I don't know about this fork, but I bought a SRAM nx 1x11 setup from them about a year ago - it looks like the real thing, it works amazingly well, and it was very inexpensive. I imagine this fork is a bit of more a gamble, but it's not an expensive one. If you got spare money that you can afford to lose, try it out. Have fun with it. Not the answer you're looking for? Browse other questions tagged mountain-bike fork shopping or ask your own question. Should I upgrade forks for a 50km race?